The State Department is looking into whether Hillary Clinton’s use of a personal email account during her tenure violated security rules, as new revelations show the agency forced the resignation of a US ambassador, partly for the similar reasons. The State Department is investigating whether or not Clinton's personal email use violated security rules that are meant to safeguard government information, theWashington Postreported. According to unnamed officials, the review is meant to consider whether the content of Clinton's emails was sensitive enough that it should have been relayed via the department's secure systems. If it turns out the content was sensitive, the State Department will determine if it was properly protected when Clinton sent her messages. Meanwhile, a report by the State Department inspector generalshowedthat former US ambassador to Kenya, Scott Gration, had “repeatedly violated diplomatic security protocols at the embassy by using unsecured internet connections.” Gration served for 13 months starting in 2011. An excerpt from the report, which resurfaced in a story by the Federalist, showed that Gration ordered a commercial internet connection installed in his embassy office bathroom so he could work there on a laptop not connected to the Department email system. He drafted and distributed a mission policy authorizing himself and other mission personnel to use commercial email for daily communication of official government business. These decisions, the report said, created security lapses, dysfunction and poor staff morale. The resignation of Gration is being revisited since The New York Times reported on Monday that Hillary Clinton, when Secretary of State, might have violated federal regulations by using a personal email account for government business. NYT said that doing so would potentially shield her correspondence from public inquiries under Freedom of Information Act requests. Her email account, which used a clintonemail.com address, was hosted by a server located at her home. Clinton has since responded to the controversy in a tweet posted late Wednesday evening, pushing the State Department to disclose the emails to the public. The department said on Thursday it would “take some time” to complete a review of the emails provided by Clinton. “The State Department will review for public release the emails provided by Secretary Clinton to the Department, using a normal process that guides such releases. We will undertake this review as quickly as possible; given the sheer volume of the document set, this review will take some time to complete,” spokeswoman Marie Harf said in a statement. 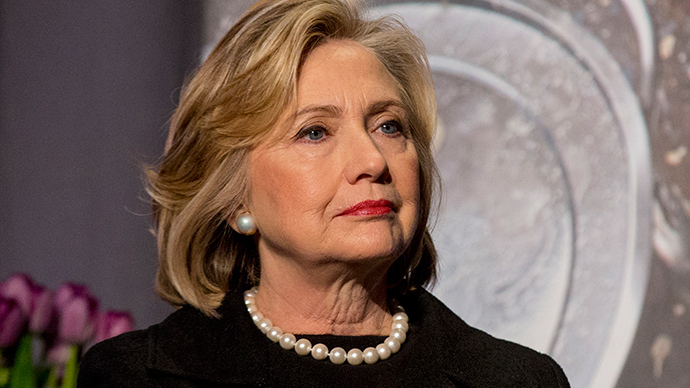 READ MORE:Hillary Clinton may have broken law by using personal email at State Dept. Clinton's advisers submitted some 50,000 pages of emails to the State Department two months ago at the government's request. But critics argue that if Clinton was using private email, it would have allowed her to pick and choose which documents to submit. Since the NYT story broke, a House of Representatives panel investigating the 2012 terror attacks in Benghazi, Libya issued a subpoena for any and all of Clinton's private emails related to the attack.